If you’re anything like me, you’ve probably sat through at least one sermon where the preacher goes into graphic detail about the crucifixion of Jesus. He may have gone into detail about how they would slowly nail nine inch nails into Jesus’ wrists and feet (and not his hands because the weight of the victim would have just resulted in the nail tearing through the palms). You may have heard that the victim of crucifixion was then lifted up and forced to hang from the cross. The position they hung from meant that they slumped forward, resulting in severe difficulty in breathing. In order to take a normal breath the victim would have to push themselves up with their legs. But this was an incredibly painful act and the victim would soon slump back down again into their original position. Eventually the victim would be too exhausted to push themselves up and they would suffocate to death. If the guards were feeling particularly merciful they might break the victim’s legs to hasten the suffocation process. And of course this was all often done after the victim was severely whipped with a multi-thonged whip, each thong ending with a sharp shard that would dig into the victim’s skin and rip their flesh out. The whole point of going into this graphic detail is to show you how much Jesus loved you. That he would go through such graphic torture on your behalf because of his deep love for humanity. But to make the physical pain of crucifixion centre-stage is to miss the point of what Christ went through. After all, in the ancient world there were many equally painful ways to execute people. The ancient Greeks devised a method called the “brazen bull” in which victims were placed inside a giant sculpture of a bronze bull and roasted alive (for added effect tubes were installed which made the victim’s screams sound like the bellowing of a bull). 2 Maccabees 7 describes how the Greek King Antiochus IV Epiphanes ordered the execution of a Jewish martyr by cutting off his tongue, hands, and feet, scalping him, and then cooking him to death in a giant frying pan. And he made the young man’s mother and six brothers watch the whole thing. And then he put them all to death in the exact same way. The point is that there was no shortage of horrific ways to kill people in the ancient world. While horrifically painful, crucifixion served a greater purpose than just torture. It was the most dehumanising and humiliating fate one could meet. When one was crucified they were taken outside of the city gates (often to the side of a busy road), stripped naked and lifted high for everyone to see. The victim would defecate and urinate over themselves as they died slowly. Passers-by could gawk and jeer at you as you screamed in agony. After you died your body was left on the cross until it rotted away or was devoured by wild creatures. Romans forbade enemies of the state from having their bodies buried because: 1) they wanted to set an example of what happens if you go against them, and 2) in the ancient world a decent burial was seen as being key to enjoying the afterlife. To make the horror Jesus experience on the cross simply about physical pain may impress/move us but it ultimately ignores the historical context and theological depth of the gospels. While modern Westerners live in a guilt culture, Jesus lived in an honour-shame culture where shame was used as a weapon. As we look over the events of Jesus’ capture and death we constantly see the theme of humiliation. The Roman soldiers gather the local battalion and dress him up as a king as part of a mock coronation in which they bow before him and spit on him. The Roman soldiers were seen gambling for his clothes at the crucifixion. “The King of the Jews” was placed on the sign above the cross, a sign which usually bore the description of the crime the person was being executed for. The religious leaders and even a fellow crucified criminal mocked Jesus as he hung on the cross. To experience the humiliation Christ did on the cross represented a complete destruction of your identity as a human. When Jesus was crucified he became an outsider, an exile from his community. When Jesus suffered crucifixion he was dehumanised by the Empire and in doing so he stood in solidarity with all of those throughout history who have been dehumanised by the power of Empire. Jesus suffers with those who have suffered under unjust regimes and economic systems. Jesus suffers with those who have been killed for their beliefs. Jesus suffers with those who have been treated as second-class citizens. Jesus suffers with those who have been subjected slander and hate speech. Jesus suffers with those who have suffered under toxic theologies that dehumanise rather than liberate. Jesus takes the shame that is often used to bully people into submission by cowards in power and he takes it upon himself. In the crucifixion we see more than a God who merely suffers physical pain for a few hours or even an impassable God who doesn’t suffer at all. In the crucifixion Jesus shows us a God who suffers with and for humanity. The crucified God is a graphic affirmation of the loving God of justice portrayed by the prophets. It shows us a God who is near to his people when they suffer, a God who grieves with his people, and a God who suffers with his people. And I think that’s a far more compelling view of God and the crucifixion. In this view of God and the crucifixion we see a stunning climax of Christ’s earthly ministry to the outcasts of society. The crucifixion of Christ becomes not just a moment of reconciliation between God and humankind but a challenge to the powers and principalities of this world. And before you breathe a sigh of relief, this is a challenge to those of us who follow Jesus because it forces us to confront our role in the systems that result in human suffering. We have to consider the effects of our vote, our purchasing decisions, and our words on others. We may even have to consider the effects of our theologies on others (do we create theologies which prop up Empire or do we create theologies which liberate people?). After all, if Jesus stands in solidarity with those who suffer then do we stand against Jesus when we wilfully support systems which dehumanise others? Or she. I fully support woman becoming pastors. 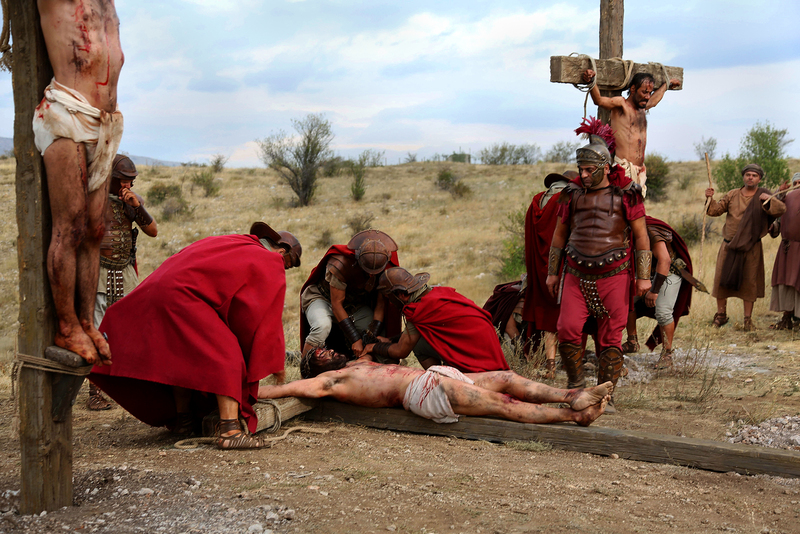 Bart Ehrman has written a really good post about why Romans crucified people here. And if this idea appeals to you I would highly recommend checking out the work of Jürgen Moltmann (aka “the Theologian of Hope”). Moltmann is a German theologian who was deeply impacted by his experiences in World War II and the events of the Holocaust. He’s been a prominent figure in the “suffering God” theology and what it means for the Kingdom of God. I'm fortunate that the church I attend no longer emphasises that physical pain in the Easter sermon, but I wish more of the churches I attended growing up had talked more about this side. That Christ identifies with the dehumanized and suffering is such an important thing for Christians to remember. Thank you for sharing your thoughts on this! !